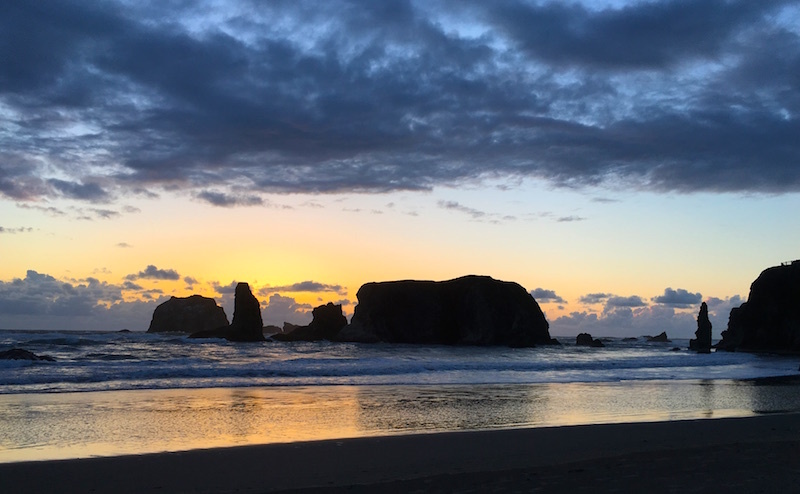 Known as Oregon's banana belt, our southern coast is almost always guaranteed to have consistently better weather and warmer temperatures than anyplace else on the coast. Dominated by sand dunes and cranberry bogs, with forested hills and craggy, wave-sculpted rock outcroppings, the region is bounded on the north by Reedsport and Brookings on the south. In between are small towns historically dominated by fishing, agriculture and timber, now joined by a tourism boom that has brought new energy, as well as lots of retirees looking for a quiet retreat from busier burgs. The view out our front window. A group of friends was planning a weekend trip to Bandon and invited me to come along, so I jumped in Chili and hit the highway. I've always thought of it as a loooooong way to go, and though it would be too much of a schlep for a day trip from Portland, a weekend is the perfect amount of time for the leisurely four-and-a-half hour drive. 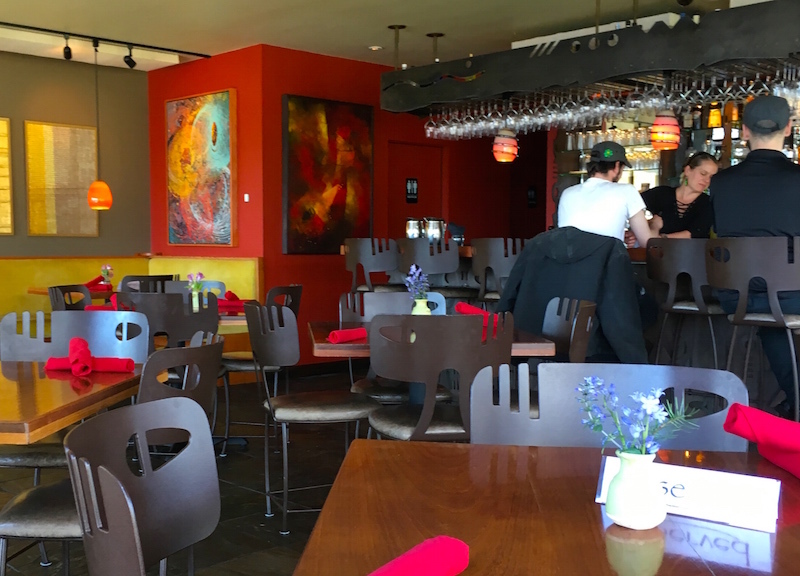 Zooming down I-5 to the turnoff for Highway 38 takes you to Reedsport along the Umpqua River through the tiny towns of Elkton, Green Acres and Scottsburg that sit along the southern border of the Siuslaw National Forest. Another stop to make in the spring is at the O.H. Hinsdale Rhododendron Garden, just down the highway from the elk viewing station. 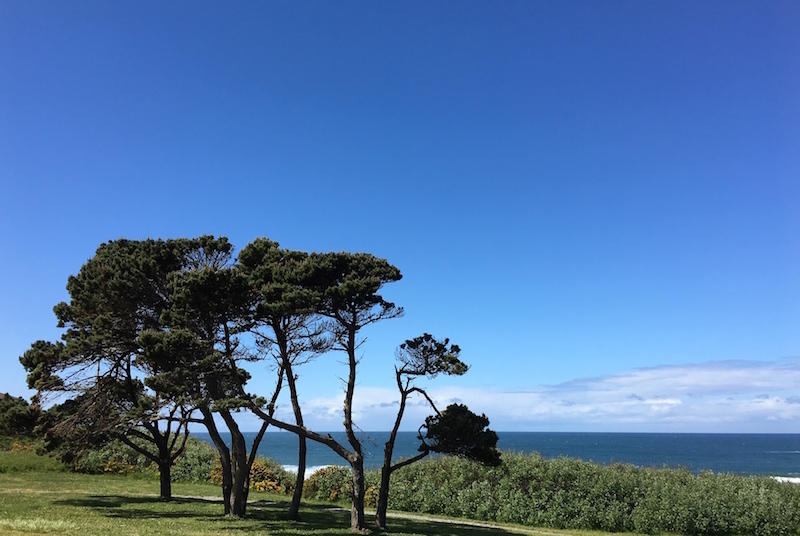 Late spring is the time to see it in all its glory, and it has special open days from mid-April to mid-May with volunteers dispensing secret rhodie knowledge. These events also feature plant sales, so plant nerds should make plans to drop in. Some of the "needles" at Bandon. Of course, after several hours on the road the group was ready for some libations and a bite to eat, so we hied ourselves down to Foley's Irish Pub in Bandon's historic town center, making sure to rub the Blarney Stone posted just outside the door. 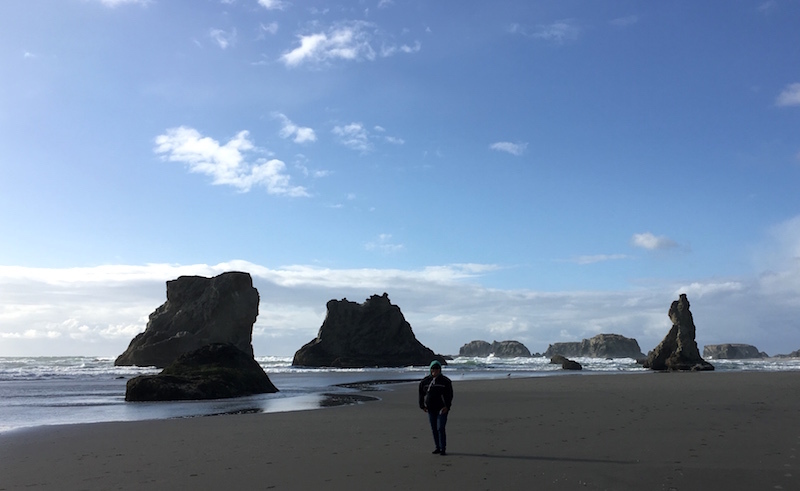 Then it was back to "our" beach for a long walk, where towering needles of rock—collectively called the Bandon Needles—marched from the cliffsides down into the surf. Other attractions are the Bandon farmers' market on Fridays and Saturdays from May through December, with local vendors sharing coastal produce, crafts and food. 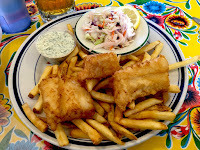 The Bandon Fish Market is just down the street with a bounty of just-pulled-from-the-sea fish and shellfish. 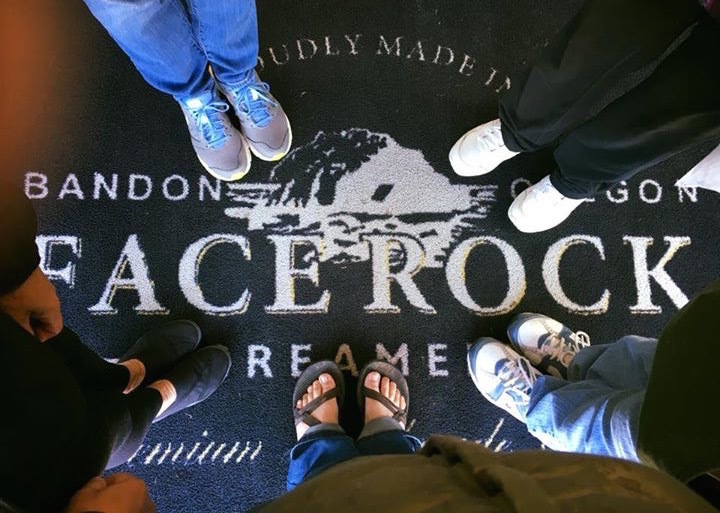 Find local cheese from local cows at Face Rock Creamery, which revitalized the old Bandon cheese factory after Tillamook bought it, closed it down and moved production to its plant in Boardman. 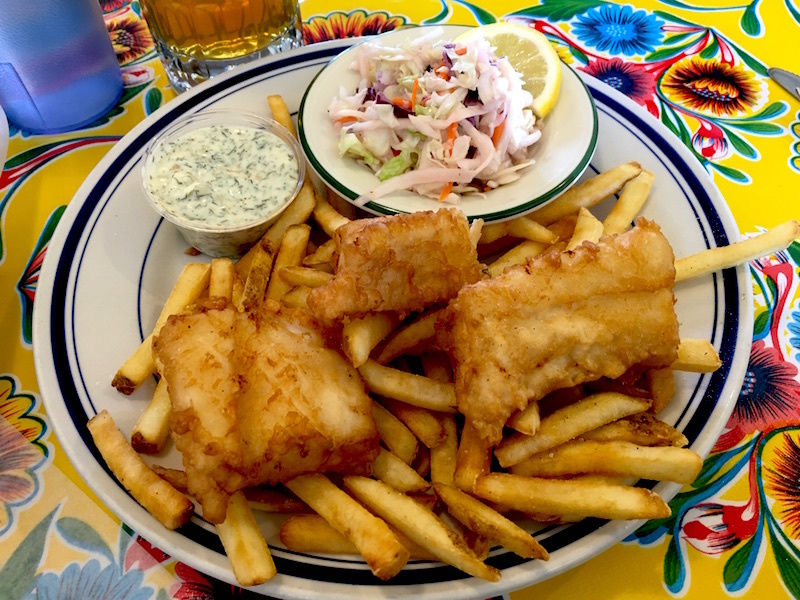 A friend of mine, Dianne Hosford, moved to Port Orford and bought a local landmark called The Crazy Norwegian's Fish & Chips, so I felt obligated—to be honest I was thrilled—to make the half hour drive south to visit her and, yes, sample her menu. 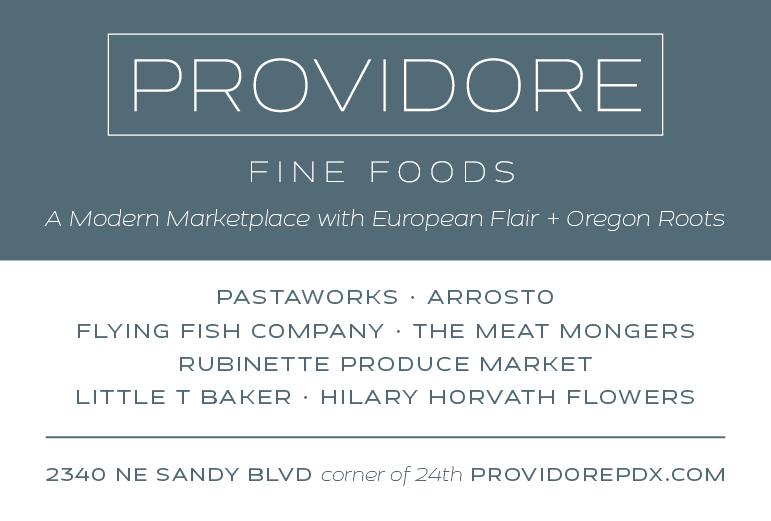 Local seafood dominates, as it should, and she buys her produce from area farmers when its in season as well as making all of her desserts in-house. This is old-school café fare that is all too rare these days and makes me pine for places like it closer to home. 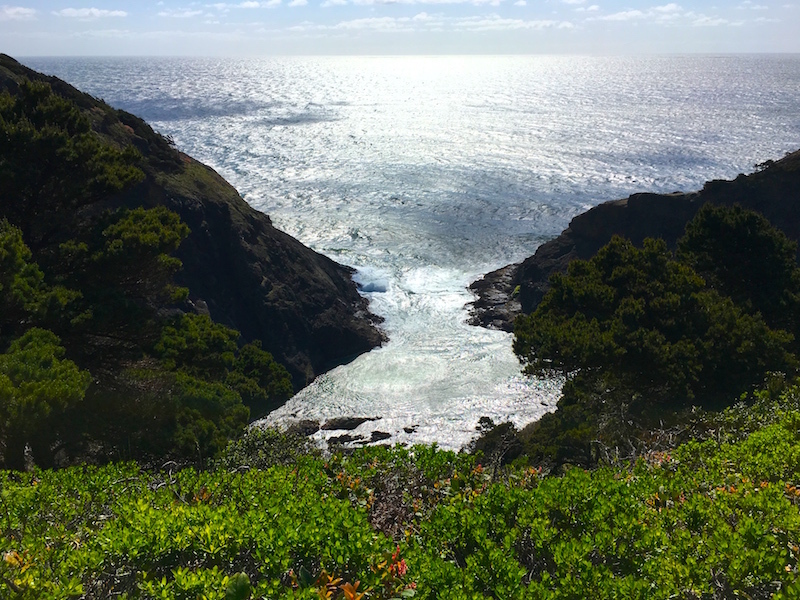 After stuffing myself on fish, oysters, coleslaw and pie (I am a professional, after all), I was relieved when Dianne offered to take me on a walk around Port Orford Heads state park on the north end of town. Wrapped around the Port Orford Lifeboat Station, built in 1934 by the Coast Guard to provide lifesaving service to the southern portion of the Oregon Coast, the stately brick station building has been transformed into a museum. A steep stairway descends precipitously from the station down to the rocky launch area, which is open to the public part of the year, but we chose to take the trail around the headland with its dramatic views of Port Orford to the south and Cape Blanco to the north. Wild irises and wildflowers were in bloom, and we ducked in and out of the treed green slopes as the ever-present wind whipped the waves far below us. A post-hike cocktail seemed in order, and Dianne shuttled me to Redfish, a stunningly classy place you'd expect to find in an urban setting rather than a tiny coastal burg, though not many of those would have its spectacular floor-to-ceiling view over the rocky southern coastline. Its sister establishment next door, the Hawthorne Gallery, was closed by the time we wandered over, but peering through the windows I could see that my next trip down I'd have make a point of stopping in there, too. Packed with beach fires at sunset, long walks at low tide and time for beach reading, this quick taste of the south coast had me pining to do another road trip in the near future. If you have suggestions for more places to visit, please leave them in the comments below! For other road trip suggestions, check out these previous Travels With Chili. Love the southern Oregon coast! So delighted you joined us for the experience. You painted the picture perfectly with your wonderful talent for word craft. Makes me want to go back soon! Loved that farmers market. Such lovely people there. Fun times! It was so much fun…thanks for inviting me along!